Whether you have a single gun, a priceless collection of antique firearms or anything in between, proper storage is a must. Many gun owners see purchasing a large gun safe as an inconvenience, but avoiding even one accident or theft makes them well worth the investment and the hassle. There is currently no universal standard regarding the materials or construction methods used in the manufacture of gun safes, and since there is no US regulatory system in place, not all safes are created equally. For most people, a gun safe is a lifetime investment, so there are several factors that should be taken into consideration prior to buying a gun safe. Buying a gun safe that’s the wrong size is a common mistake among first-time buyers. Gun owners tend to consider the number of firearms they have on hand then buy the smallest safe they can possibly get away with. What they don’t realize is that, as soon as the safe comes home, family members will notice that the fireproof construction makes a gun safe the perfect place to store important documents and other valuables. A good rule of thumb is to measure your guns and any non-gun items that you may be storing in your safe. Use this information to determine what size you need, then opt for a safe that’s one size larger. Shopping for gun safes in Denver? We can help! The overall strength of a safe is determined by the thickness of the steel. The numbers used to gauge steel are often confusing because they go backwards. This means, for example, that 10-gauge is thicker than 12-gauge. Experts recommend no thinner than 10-gauge steel for a home safe, but thicker provides greater security. A safe is only as good as its lock. When shopping for gun safes in Denver, look for one that is sufficient for your needs. 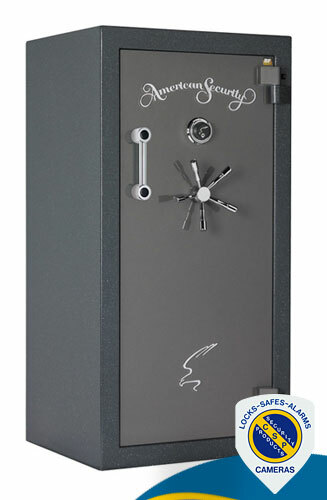 Gun safes are available with mechanical and electronic locks. For many gun owners, electronic locks are the more appealing option because they allow for faster, easier access, and there are up to 1.2 million possible combinations. Some locks even offer fingerprint scanners. Not all gun safes come with a warranty. Ideally, you should choose a gun safe with a lifetime warranty that covers the either the entire safe or its most important components, like the locking mechanism. Unfortunately, good warranties typically only come with higher-end, expensive safes. If you’re in the marketing for a gun safe in Denver, Colorado Security Products. We sell high quality AMSEC BF Series Gun Safes that are ideal for protecting firearms against theft, fire and moisture damage. To find out more, call 303-756-1000 now.